Star Micronics releases TSP100IIIW, the 3-inch thermal printer equipped with wireless LAN communication function, to start the sales from February, 2016. This is the latest model in the TSP100 series awarded the top position in our printer line-up which has accumulated the total sales number to 1.2 million units until now. 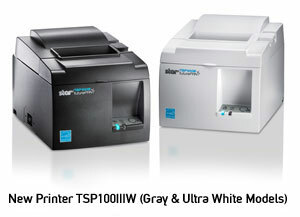 TSP100 series rolled out to the market in 2005 with the innovative concept of “multi-functional utility and all-in-one package” which was the first in the industry and established its firm status in the POS printer market thanks to the good reputation from the market. We have kept our leadership in the market trend releasing the TSP100IIU, the world-first environment-conscious Eco-printer, which now passes the baton to this newest model, TSP100IIIW, focusing on further functionality and convenience of usage to expand our market share. These days, the market has strengthened the demand for mobile POS (hereinafter mPOS) which can support the POS and payment function through tablets and smartphones. This new product, TSP100IIIW, not only inherits the futurePRNT function (*1) which is highly reputed from Windows users but also has higher affinity to the iOS and Android devices used in the mPOS. TSP100IIIW now supports the wireless LAN communication for the first time and can easily setup the network and security settings by making use of the WPS (*2) which allows easier connection setup with wireless routers and access points. On the other hand, TSP100IIIW has a wider functionality while keeping the compatibility with TSP100 series, given the highest printing speed of 250mm/s in the series as well as the de-curl function (*3) which keeps the printed receipt from curling. Moreover it is equipped with USB port to supply 5V for charging the mobile devices and tablets and lines up sophisticated case color (Ultra-White) for mPOS users. Inheriting the traditional all-in-one package concept, everything necessary is included in the package box such as sample roll paper, power cable and wall-mount kit and also the user-friendly features on setup and setting change are further enhanced by the special store application (*4) and online manual. The new product targets 30,000 units of sales by the end of fiscal year 2017, expanding the market from Japan to USA, Europe, Asia and other worldwide territories. We are already proud of high market share in the mPOS printers but will try harder to increase it through this new product introduction. We will exhibit this printer in the NRF in USA from 17th to 20th of January and in EuroCIS in Germany from 23rd to 25th of February. We hope you will visit our booth to experience the demo. (*1) Enables not only the high speed printing even for complicated print data but also the design adding function onto the sales promotion messages and pictures on the receipt by controlling and processing the print data in upper application side before downloading it to the printer. (*2) A kind of wireless LAN communication standard to ease the setup procedure, which is generally called Wi-Fi Protected Setup. (*3) Not guaranteed if non-Star-recommended paper is used. (*4) A special iOS or Android application downloadable from App Store or Google Play. » Equipped with WPS compatible wireless LAN interface enabling the easy wireless setup procedure with high security. » Achieved the printing speed of 250mm/s which is the highest in the futurePRNT series thermal printers. » The stylish new color, Ultra-White, is lined up. Adopted cool blue based logo design and LED. » The package includes printer, sample thermal roll paper, power cable and wall-mount kit. » 5V USB port allows mobile device charging. » Easy installation, setting configuration and other practical supports by special utility applications downloadable from App Store and Google Play. * iOS or Android utility applications. App Store is a trademark of Apple Inc. Google play is a trademark of Google Inc.
»HTML manual provides the latest documents any time. » AllReceipts, the free electronic receipt service, supported. -iPad and iPhone are trademarks of Apple Inc., registered in the U.S.
-App Store is a service mark of Apple Inc..
-IOS is a trademark or registered trademark of Cisco in the U.S. and other countries and is used under license. -Trademark of iPhone is being used under license of Aiphone Co., Ltd..
-Android and Android logo, Google Play and Google Play logo are trademarks or registered trademarks of Google Inc..
-futurePRNT is a registered trademark of Star Micronics Co., Ltd..
(Note) The specifications and dimensions mentioned above are subject to change without notice.